Apple Computers is known for producing iconic computer and mobile technologies, characterized by rigorous precision and sleek styling. When All Wire Electric partnered with Apple in 2013 to wire their new 10 000 ft2 retail space at Seattle’s Bellevue Square, we learned they apply the same principles to storefront construction. This project required meeting numerous unique build specifications, high above industry standard, that All Wire Electric was proud to deliver on. Today it stands as one of our most impressive recent projects. Working with Dickinson Cameron Construction of San Diego, All Wire Electric employed as many as eight electricians on this project. We worked off of Appleâ€™s floor plans, towards routine inspections by their in-house project managers. All of our measurements needed to be accurate down to 1/8 of an inch. 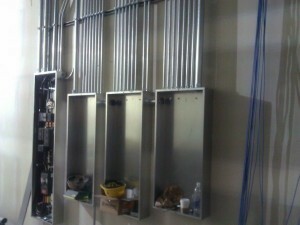 All Wire is the ideal electrical partner for Seattle’s general contractors. This applies to the location of receptacles, switches, outlets and so on. In the particular case of this store, it also meant laying out floor boxes in exactly the right and precisely cutting tracks into the so conduit could be run under the finished floor to feed them. All Wire met these expectations without the need for any corrections. Apple stores also require some unique features, such as their lighting system. All Wire remained flexible and efficient in the design and redesign of a ceiling lighting system that met both local code requirements and Apple’s needs. In this case the challenge was finding a balance between Apple’s desire for overall brightness in the store on the one hand, and Washington State’s energy code limitation on the limit of watts per square foot on the other. Complicating matters was the requirement for sufficient emergency lighting and the fact that a fabric ceiling had already been installed, making changes difficult. Ultimately, the original plan proved insufficient and required a complete redo. All Wire accepted this challenge and after an extensive revision process with an Apple designer, was able to install a completely redesigned lighting system in a single weekend so that the Apple store could still open on schedule. After 9 months and over 3700 man-hours All Wire is proud of the fact that the Apple retail store in Bellevue Square was finished on time and to Apple’s high standards. It is a testament to quality design and precision workmanship.